The extensively re-written and updated edition of this highly acclaimed text provides a synthesis of the latest research on the cognitive defects of dyslexia and reviews evidence concerning its biological bases. 2. The Definition of Dyslexia. 3. The Phonological Representations Hypothesis. 4. Learning to Read and to Spell. 5. Dyslexia: A Written Language Disorder. 6. Individual Differences in Dyslexia. 8. Biological Bases of Dyslexia. 9. Dyslexia: A Sensory Impairment?. 10. Helping to Overcome Dyslexia. 11. Proficiency and Deficiency: The Role of Compensation. 12. Conclusions and Future Prospects. "This book by Margaret Snowling...is a very welcome update of her well-received first edition book published in 1987 and reflects the significant amount of research that has taken place since this time. Margaret Snowling's thesis is that dyslexia is a consequence of a phonological deficit. Her evidence for this is extremely well presented throughout her book. Chapter 3 - The Phonological Representations Hypothesis - is exceptionally well written and assertively lays down the foundation of her argument. 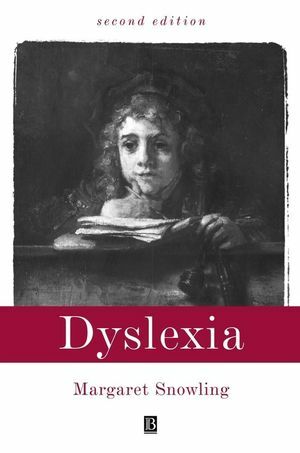 This book, although written with an academic rigour, cleverly embraces the impact of dyslexia on the individual...This promotes a very positive and optimistic theme on the treatment of dyslexia throughout the book. This book successfully provides a contemporary synthesis of research on the cognitive deficits of dyslexia and is strongly recommended to anyone with any involvement or interest in this complex area. It will be of enormous value to educational psychologists and teachers of students with specific learning difficulties and, no doubt, will continue to be the essential book on any training course's reading list on the subject. The book is very generously priced and therefore of exceptional value, given its contents." Principal Educational Psychologist, The Dyslexia Institute. "An excellent view of the current state-of-the-art in dyslexia research, as is to be expected from this author, who is a recognized authority in the field. It is committed to a phonological approach to dyslexia, which explains the condition as a deficit of phonological representations. Snowling's book gives an outstanding account of this research tradition." TRENDS in Cognitive Sciences, Vol 5, No 3, March 2001. * Extensively re-written and updated, ensuring it remains the leading text in the field. * Reviews research on the cognitive deficits of dyslexia and the evidence concerning its biological basis.